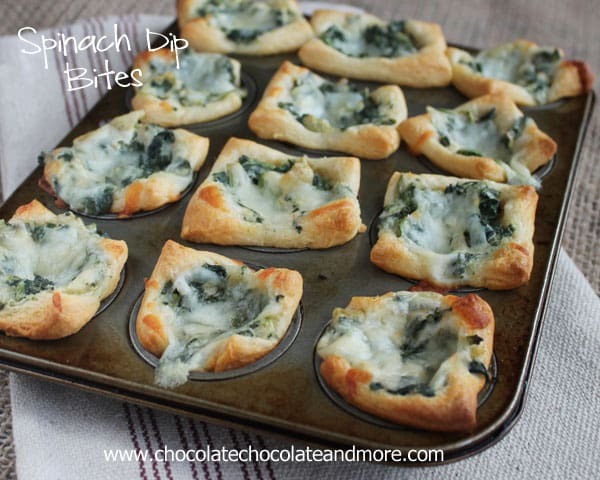 Spinach Dip Bites - Chocolate Chocolate and More! Thank you to Pillsbury for inspiring me to make these Spinach Dip Bites-perfect for any party! A few weeks ago, I had an amazing opportunity. Pillsbury invited me to their test kitchens in Minneapolis, Minnesota! Let me tell you right now. If I ever decide I need to work full time, I’d want to work for them. It has to be one of the happiest places on earth to work at. Not to mention the fact that I love their products. They didn’t just invite me though. They invited 15 other bloggers, many whom I’ve been online friends with, and a few new ones that I can now call friends. So much fun. How can you go wrong, when you’re in a group of people who all love playing in the kitchen as much as you do? Meet (standing L to R) Sheryl-Lady Behind the Curtain, Zainab- Blahnik Baker, Tonya-The Gunny Sack, Kate-Diethood, Heather-Heather’s French Press, ME!. Trish-Mom on Timeout, Julie-Julie’s eats and Treats, Emily-Sweet Bella Roos, (kneeling L to R) Dana-Dana’s Food Blog, Lisa-Wine and Glue, Jocelyn-Inside Brucrew, Ashley-Kitchen Meets Girl, Gerry-Foodness Gracious, Jocelyn-Grandbaby Cakes and (front) Shawn-I Wash, You Dry. I could give you a novel on why each one of these foodies are amazing. Instead, just go check them out for yourself. You won’t be sorry. Pillsbury broke us into 2 groups. I spent the morning in the test kitchen and then the afternoon in the photography studios. Kate and I partnered up immediately. 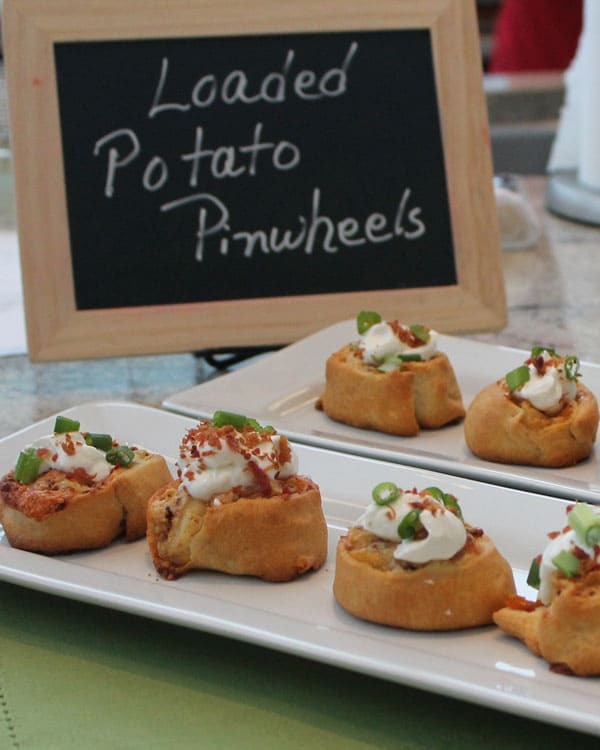 We first made the million dollar prize winning Loaded Potato Pinwheels using the seamless crescent dough. You can see how delicious they look and they taste so good! I knew immediately what I wanted to make when I got back home. We always love spinach dip in my house. So easy to whip up a batch. But them, about half way through eating it, everyone gets tired of dipping. Yeah, we might have a few lazy people in the house. I personally think, it’s because when ever we have it, there’s a game on the TV or a party going on, it’s just too much trouble to try and scoop out a serving and then grab some chips. 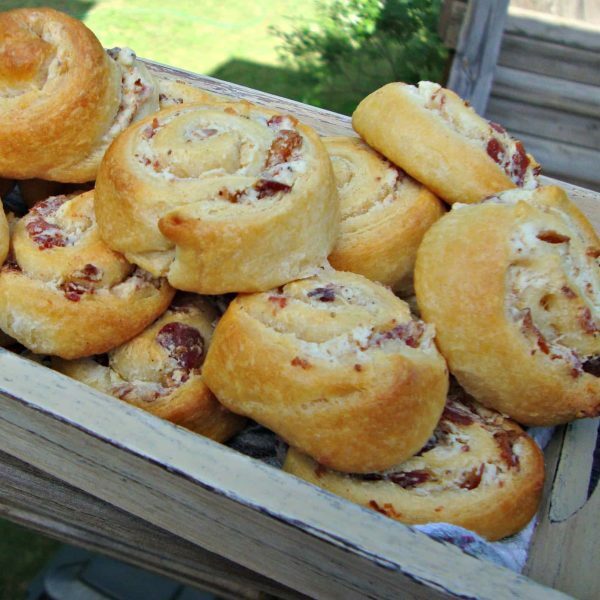 We prefer appetizers that you can just grab with one hand and start eating. These Spinach Dip Bites were gone in a flash, proving my theory once again. If you make it easy for them to eat, they’ll eat them all! Combine spinach, artichoke hearts, garlic and Parmesan cheese in a mixing bowl. 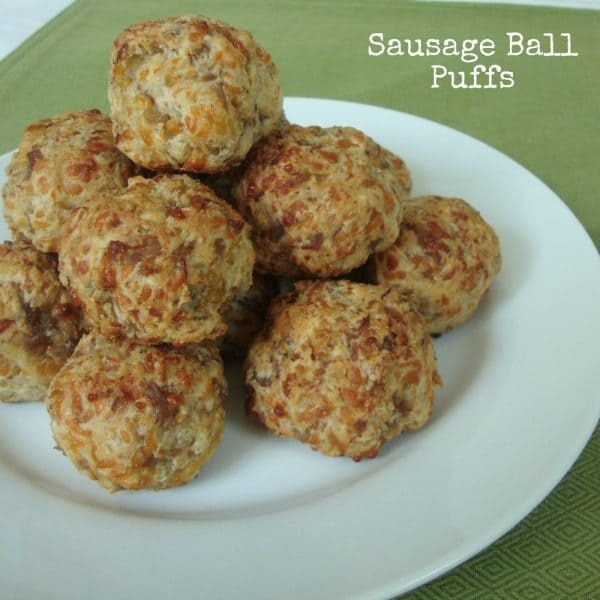 Blend in cream cheese and 1/4 cup of mozzarella cheese. Season with Salt and pepper. Set aside. Place one rounded teaspoon of your spinach mixture on top of each crescent square and gently push in, just to secure. (The Bites will drop and mold to your tin while baking.) Divide the remaining mozzarella cheese over the tops of each cup. Bake in a preheated 375 degree oven for 15 minutes, just until a perfect golden brown. Let rest in tin for 5 minutes before removing to serving tray. Your day looked so fun! So happy that you got to be a part of that! 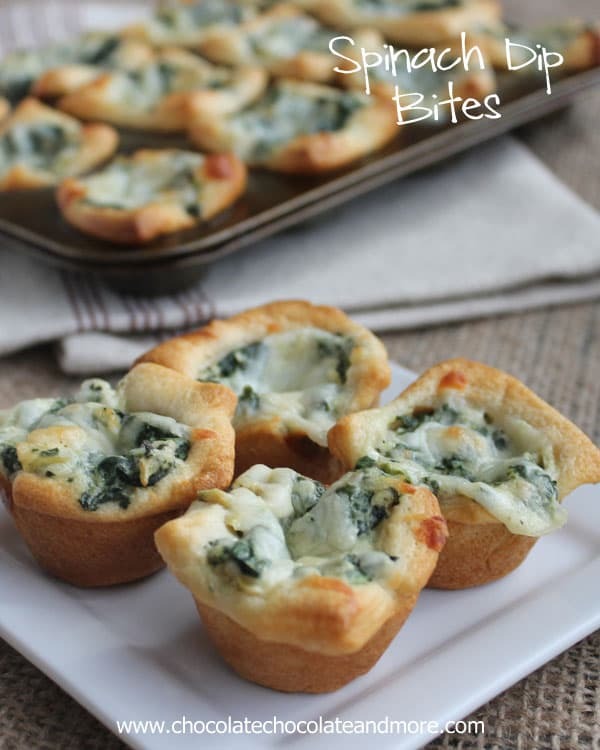 And, these spinach dip bites…yes please! 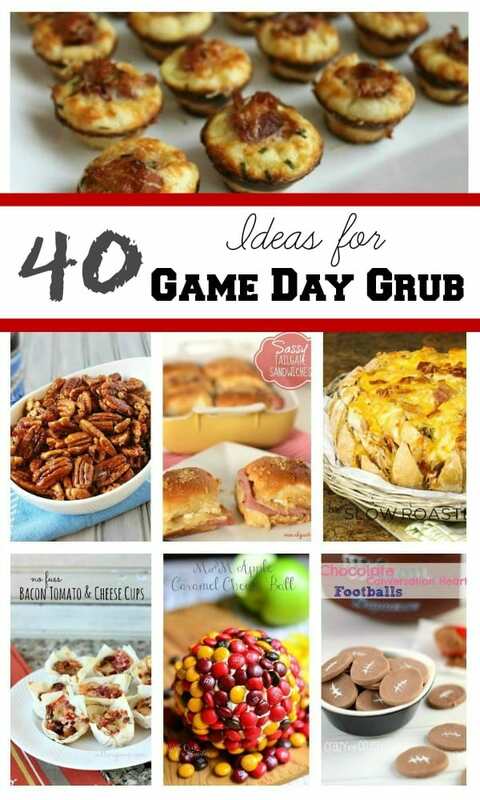 Love how simple these are, but also such a fun way to eat one of the greatest game day foods! Pinned! Be still my heart! I could eat my weight in spinach dip, so you placing it onto such a perfect transportation device makes me love you too the moon and back, Joan! Yes!! I can eat a dozen of this without realizing it. They are so good. So glad I met you in MN!! 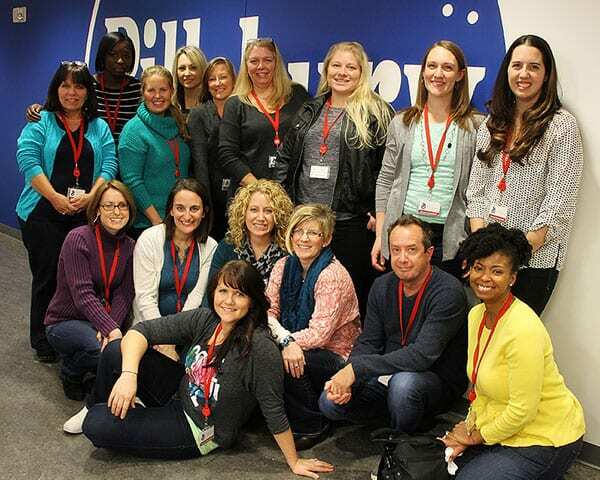 Sounds like you had a lot of fun on your Pillsbury trip! Love this clever dip appetizer. No more running out of chips before you run out of dip. Happy New Year, Joan! I’m so jealous-that looks like such an amazing experience! 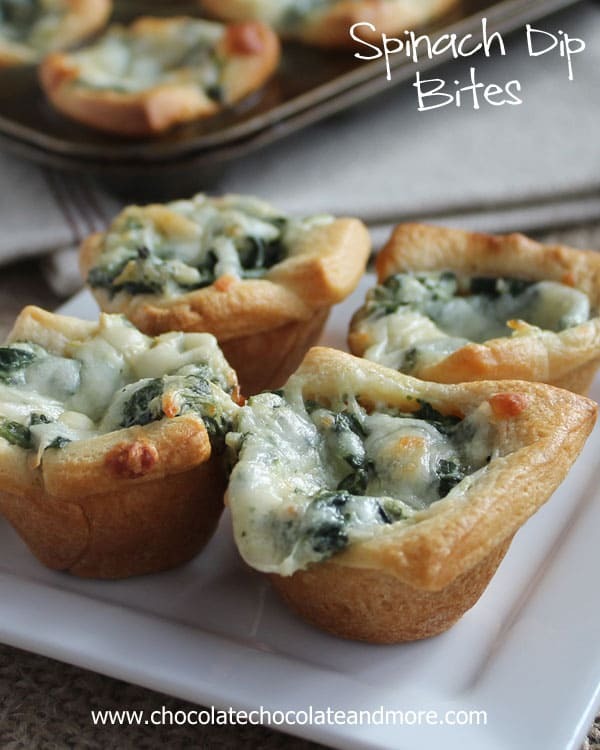 and omg these bites–I looove spinach dip and I can tell these must be little pieces of heaven! These look amazing! I’m a sucker for spinach dip anything…it was GREAT to meet you Joan! These look amazing- thank you so much for sharing them at Marvelous Mondays this week! 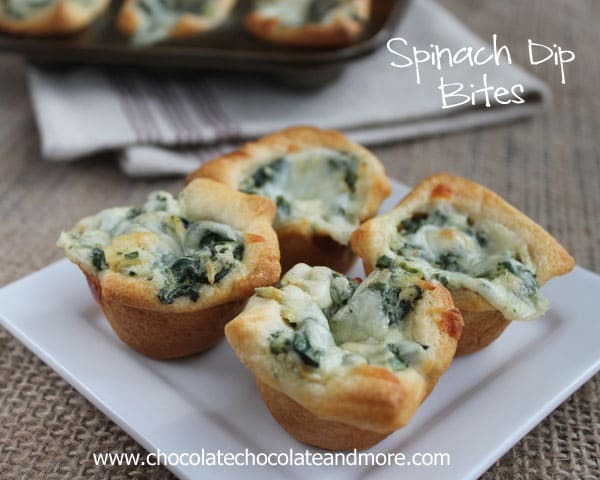 You had me at spinach…I swear I could easily become a vegetarian! These look great! Thanks for sharing such a delicious appetizer. These were FANTASTIC! I added a little garlic powder, just cause we like garlic, and my husband and I ravaged all 24 of them when he got home from work today! So easy and so delicious! I wonder if this could be frozen and then baked? This would be something yummy to heat up after baby #2 comes in a few weeks 🙂 thank you for sharing!! Oh my gosh, I can practically taste them, Joan! Yummo! 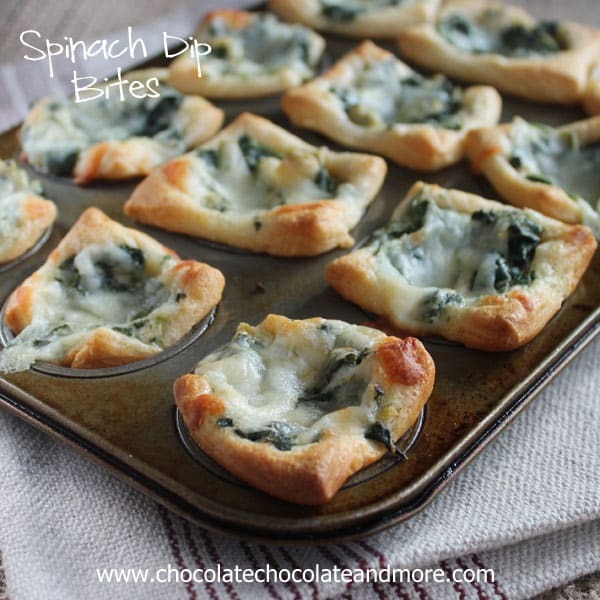 I can’t wait to make these i Love Love Love Spinach and I Hope I Love Artichoke Hearts as well I have some in my pantry so i will try them and i will Let You Know if they come out as good as they Look Because They Look Soo Delicious and Yummy & Scrumptious !!! I have trouble finding the seamless dough too so I just buy the crescent roll dough. I unroll it flat and pinch the seams together to form 1 sheet. Then follow the recipe from there. Hi Joan! 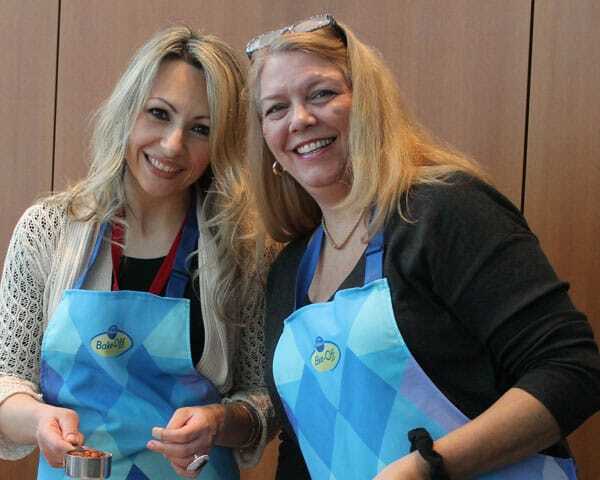 You know you are one of my very favorite Foodies and I am so happy you were invited to the Pillsbury kitchens. Looks like you had a great time! I’m addicted to checking your blog because you always have something I want to try. I love to cook; so, thank you for all the delicious food ideas!